Phil and Tim are your local Melbourne Building Consultants. 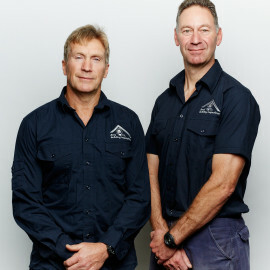 Tim and Phil have worked together for over 20 years in the building industry. They have renovated and developed many of their own properties. Tim is an electrician and still runs his own electrical business that employs four other electricians. Tim’s wealth of experience in the electrical field can be very beneficial to anyone looking to purchase a property, whether it be residential or commercial. Not only can he give peace of mind that the property meets Australian Standards and is safe, he can also give an accurate guide on what it would cost to do any remedial electrical work. Phil has completed a termite and pest course (Certificate III in Pest Management) as well as doing several asbestos courses (Conduct asbestos assessment associated with removal) and (Plan and undertake Site inspection and assessment (sampling) Statement of Completion). He has also completed a HIA Residential Building Inspectors Course. Tim and Phil joined Jim’s Building Inspections in April 2012 and, with the support of Jim’s behind them, have now gained a wide trust in both of their dealings with clients and agents. Both Tim and Phil believe that customer service is critical and provide a detailed report of major and minor defects of a property, complete with photos. Don’t let buying your dream home turn into a nightmare – Call Tim and Phil.